Sept. 20, 2013, 10:19 a.m.
Plus: Reuters cans its Next makeover, the news on NSA surveillance and Syria coverage, and the rest of the week’s media-tech top reads. By Mark Coddington @markcoddington Sept. 20, 2013, 10:19 a.m. The Navy Yard and breaking-news errors: The U.S. had another mass shooting this week, this time in the Navy Yard in Washington, D.C. There was a good deal of quality journalism done in the shooting’s wake, but in what’s become a pretty common theme, the story about the news coverage of the situation centered on its errors in reporting breaking news. Poynter’s Andrew Beaujon has a good, quick summary of the news media’s sins in the case, which included several news organizations naming the wrong suspect, and live-tweeting the police scanner. The Washington Post’s Paul Farhi reported on the dangers of relying on initial reports and scanner traffic, quoting one longtime reporter as observing, “We’ve gotten into a situation where the media’s standard operating procedure has become report first, confirm second and correct third.” Slate’s Will Oremus said that while journalists shouldn’t simply wait until information is confirmed by police to report it, they should be especially wary of naming names, as opposed to more tangential details. You could sense a lot of the weariness of these errors in commentary about the Navy Yard story: Poynter’s Craig Silverman wrote a wryly generic column linking to the numerous posts he’s written in these situations in the past, noting that we nod our heads and pass along the “better to be right than first” advice, but keep getting it wrong when these stories arise. Gawker’s Tom Scocca told people to just ignore breaking news in tragedies because it’s so consistently wrong. “Those alarming yet tedious hours between something horrible happening and anyone figuring out what it was — forget about it, unless you’re in the vicinity,” he wrote. Circa’s Anthony De Rosa lamented journalists’ addiction to anonymous sources in these cases, but wondered if errors that resulted are really chipping away at the public’s trust like they should. Reddit, whose members had created such a stir with their efforts to identify the Boston Marathon bombers, quickly shut down a section dedicated to finding the Navy Yard shooters because it violated the site’s ban on posting personal information. Mathew Ingram of GigaOM broke down what both traditional media and crowdsourced media can add to reporting in breaking-news situations, urging professional journalists to make more use of crowdsourced sources like Reddit in an effort to improve information and avoid errors. Media shield law blowback: The efforts to create a national U.S. media shield law allowing journalists the legal right not to disclose their anonymous sources cleared a big hurdle late last week, with a bill passing the Senate Judiciary Committee. But several critics expressed their wariness this week that the bill would actually curb journalists’ protections. A strong article by Steven Nelson of U.S. News & World Report lays out the range of objections: The bill wouldn’t protect against the government’s surveillance of journalists in leak investigations, it would open the door for the courts to limit journalists’ rights, and it would allow the government to engage in the unconstitutional and anachronistic act of defining who is and isn’t a journalist. Reuters knocks out Next: Reuters killed its ambitious plan for a remade consumer-oriented website called Next this week, with Reuters CEO Andrew Rashbass saying in a memo that it’s “a long way from achieving either commercial viability or strategic success.” Reuters will build its web plans going forward around its current site. For some background on what Next was supposed to be, check out Capital New York’s feature on it from January and the Lab’s piece on the unveiling of its preview in May. Matthew Zeitlin of BuzzFeed has all the inside details about why the project died, focusing on two main factors: 1) It was intended as a way to improve Reuters’ brand perception, rather than to make money, and the CEO got tired of throwing money at it; and 2) the massive technical challenge of overhauling the site simply couldn’t be overcome in anything resembling a timely manner. The Lab’s Justin Ellis put Next in a broader context, framing it as part of newswires’ halting efforts to shift from strictly business-to-business products to public-facing news organizations. — After months of rumors that a split was imminent, Kara Swisher and Walt Mossberg, co-editors of the popular tech site All Things Digital, announced they would leave News Corp.-owned Dow Jones, which has owned their site since it launched. (Mossberg will also leave his post as tech columnist at The Wall Street Journal, also part of Dow Jones.) It looks like Dow Jones will keep the All Things Digital name and look for a buyer or partner, while Swisher and Mossberg will launch a new tech site and events business that could be valued at $30 million to $40 million. — A few notes on the ongoing NSA surveillance story: A U.S. federal judge ordered the Justice Department to declassify a set of secret court rulings about the surveillance program, noting that Edward Snowden’s leaks had sparked an important public debate on the program. GigaOM examined the security industry in turmoil as a result of the latest revelations about the NSA getting around encryption measures, and the Columbia Journalism Review outlined encryption basics for journalists. The Washington Post’s Erik Wemple wondered why Time magazine hasn’t done much with the Snowden leaks. — Notes on the war in Syria: A Pew poll this week found that the new Al Jazeera America is covering the conflict much like its peers in American cable news, which is quite a bit more hawkish than the U.S. public. Reuters’ Jack Shafer wrote about how the chemical attacks in Syria triggered American journalism’s “alarm” function. And On The Media and BuzzFeed highlighted the freelancers and women, respectively, reporting from Syria. — NPR announced a voluntary buyout program intended to cut 10 percent of its 840-person staff in an attempt to balance its budget by 2015. It also named California businessman and NPR board member Paul Haaga Jr. as its interim CEO, after the departure of Gary Knell to National Geographic. — The U.S. Federal Trade Commission announced that it would be looking more closely at native advertising, and The New York Times’ David Carr explored the potential problems it might cause. Blogger Andrew Sullivan echoed his concerns. — Finally, the Lab’s Ken Doctor provided a useful primer on news organizations’ forays into the events business — what they’re doing, why they’re doing it, and how to do it well. 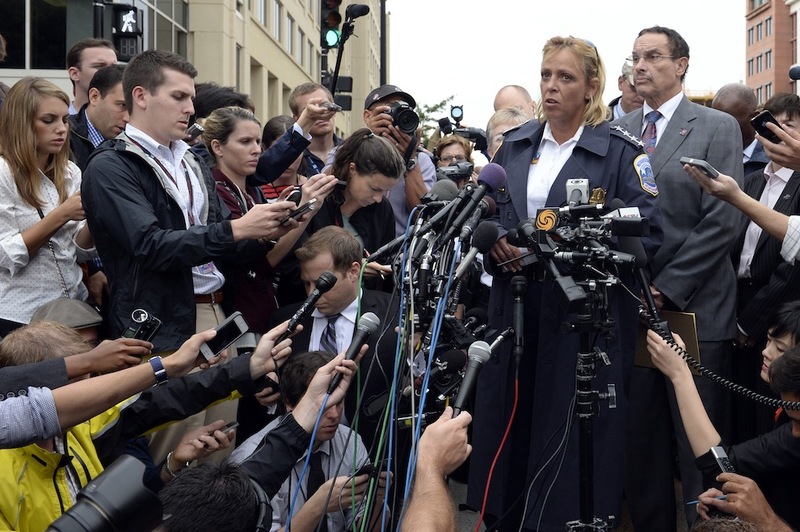 Photo of D.C. police chief Cathy Lanier by AP/Susan Walsh. 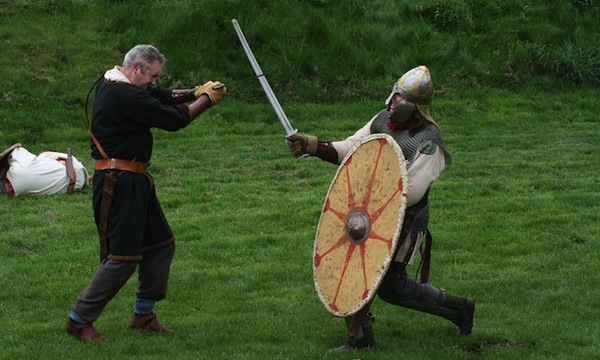 Photo of shield by Dave Pearson used under a Creative Commons license. POSTED Sept. 20, 2013, 10:19 a.m.
Coddington, Mark. "This Week in Review: The breaking news errors continue, and media shield law skepticism." Nieman Journalism Lab. Nieman Foundation for Journalism at Harvard, 20 Sep. 2013. Web. 18 Apr. 2019. Coddington, Mark. "This Week in Review: The breaking news errors continue, and media shield law skepticism." Nieman Journalism Lab. Last modified September 20, 2013. Accessed April 18, 2019. https://www.niemanlab.org/2013/09/this-week-in-review-the-breaking-news-errors-continue-and-media-shield-law-skepticism/.